A broad-ranging investigation into the deaths of two experienced sailors in this year's Chicago to Mackinac Island race is likely to lead to changes for one of the world's oldest and most esteemed races. 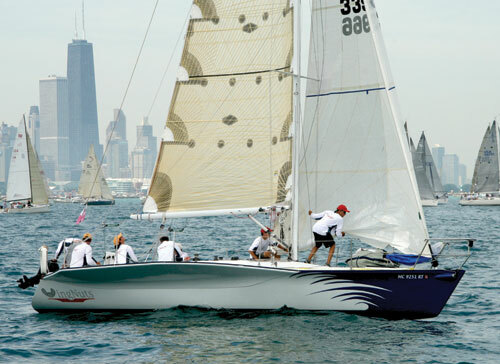 A U.S. Sailing-appointed independent review panel of safety experts continues to investigate the deaths of Mark Morley, 51, and Suzanne Bickel, 41, both of Saginaw, Michigan, after the boat they were sailing on turned turtle during a storm July 17 while the boat was competing in Chicago Yacht Club's Race to Mackinac. The panel is looking into all factors related to the first accidental deaths in the history of the race, which has been sailed 103 times. Weather, boat stability, safety equipment, the response by the Coast Guard and other competitors and more are being considered, said panel member John Rousmaniere. The panel will present its finding to US Sailing and Chicago Y.C. in October. Panel Chairman Chuck Hawley said that while the group will not make specific recommendations, changes usually come from such investigations. "If you look at studies that have been done after marine tragedies, especially when there are storms that affect a lot of boats, the results that are complied by a panel tend to change the equipment rules or sailing instructions for future races," Hawley said. "It isn't because the panel told them to change, it's because they find results that indicate change is necessary." One of the aspects being investigated by the panel is the textbook rescue of six crewmembers from the overturned Kiwi 35 Wingnuts. The crew of the Beneteau 40.7 Sociable, owned by Bob Arzbaecher of Milwaukee, Wisconsin, is being lauded for its quick response to the tragedy. "This was an admirable rescue," Rousmaniere said. Arzbaecher said his crew heard a faint whistle following a storm that swept through the bulk of the race fleet around midnight July 17. Sociable, which was sailing about 15 miles northwest of Charlevoix, Michigan, was raising its mainsail, that the crew had taken down before the squall, which had gusts to 60 knots. A crewmember then saw a faint light, about a quarter to a half-mile to port. According to a report Arzbaecher submitted to the Chicago Y.C., the Sociable crew dropped the mainsail when it became clear they were being signalled by a boat in distress and powered in the direction of the lights. The wind had moderated considerably to 15 to 20 knots, but the confused sea still had 3- to 5-foot waves, he said, and as they approached the lights, they recognized that the boat was turtled with several people standing on the overturned hull. Six of Wingnuts' crew-Mark's brother Peter Morley; Stuart Morley, Peter's 15-year-old son; John Dent; Stan Dent; Lee Purcell; and Christopher Cummings, 16-were either on top the overturned hull or hanging onto the hull in the water. "It all happened so fast that you just went into rescue mode," Arzbaecher said. "I didn't feel nervous, we were just motoring along trying to be smart about how we picked them up. "The first pass we made was too close. There weren't any lines visible in the water, but I got really close to the bow and it was clear that it was too close. On subsequent passes I probably stayed 20 feet away." Sociable's crew used a Lifesling man overboard recovery system to get the six Wingnuts crewmembers aboard, starting with one crewmember who remained in the water. Arzbaecher said it took about 15 minutes to get that crewmember on board and another 10 minutes to rescue the other five crewmembers. "We didn't even bother trying to throw the Lifesling to them after the first attempt," he said. "We just towed it behind the boat. The line floats so the guys were jumping in and grabbing onto the line and we'd just pull them in. It worked great." Meanwhile, Sociable crewmember Brian Adams took control of radio communications, remaining in contact with the Coast Guard and dozens of other boats competing in the race that offered assistance. Twenty-three boats received redress from the race committee for assisting in the search for the missing Wingnuts crewmembers, Rousmaniere said. Adams' skill on the radio was particularly helpful in light of the fact that it took more than an hour for the Coast Guard to arrive, Arzbaecher said. "Brian did a great job," he said. "He was assigning other boats grids to search. It was surprising that it was going to take an hour for the Coast Guard to get there and we thought we better take things into our own hands." The Coast Guard received signal notifications from two personal satellite messengers systems worn by members of the Wingnuts crew. Spot Satellite GPS Messengers like those used by members of the Wingnuts crew are often used by hikers and skiers and work by sending a signal to the GEOS International Emergency Response Center which then notifies emergency responders based on location and personal information. "These turned out to be very effective," Rousmaniere said. Arzbaecher said it wasn't until about 15 minutes after the Wingnuts crew were on board Sociable that they mentioned they believed Morley and Bickel may be trapped under the overturned hull and tethered to the boat. "Obviously that was a piece of information we wish we had gotten earlier instead of later," he said. Adams passed the information about the missing crewmembers to the Coast Guard, including a request for a rescue diver, which was not available, according to Arzbaecher's report. A 41-foot Utility Boat from the Charlevoix, Michigan Coast Guard Station and an MH-65 Dolphin rescue helicopter from the Coast Guard Air Station in Traverse City, Michigan, responded. Although the helicopter was manned by a surface swimmer, such swimmers are not equipped for underwater rescues, said Lt. Adam Saurin, a Coast Guard public affairs officer based in Sault Ste. Marie, Michigan. According to Saurin, the Coast Guard in that area works with a county-led task force with divers, and had it been known that a diver was necessary prior to launching the helicopter, one could have been arranged. Crewmembers from the utility boat knocked on Wingnuts' overturned hull when they arrived on the scene and received no response, according to the Coast Guard report. It wasn't until the following morning that divers from the Charlevoix County dive team found the bodies of Mark Morley and Bickell underneath the overturned Wingnuts intertwined in tethers and lines, said Charlevoix County Sheriff Don Schneider. The Charlevoix County medical examiner listed the causes of death as head trauma, Schneider said. After rescuing the six survivors, the crew on Sociable made sure the Wingnuts sailors had dry clothes and blankets. Sociable remained on standby at the request of the Coast Guard for almost three hours before motoring about two and a half hours to Charlevoix, Arzbaecher said. "We radioed the Coast Guard several times and asked what they wanted us to do with the survivors," he said. "We never got an answer other than to stand by. Finally we just decided that we had to get these people to Charlevoix. "It was obviously a somber ride in," he said. "We were excited that we had participated in the rescue, but somber that we had left two people behind." It is still unclear why Wingnuts capsized in the severe but not unusual storm, members of the U.S. Sailing-appointed panel said. The boat, a Kiwi 35, is an unconventional design by O. H. Rodgers with winglike extensions on the hull. The boat weighs 2,850 pounds, 1,100 pounds of which is ballast in its 7-foot keel. It was first built in 1984. The race allows boats of a "seaworthy offshore type construction of at least 26 feet LOA" in fully crewed monohull divisions. The boat self-righted sometime after the county dive team recovered the bodies, Rousmaniere said. Prior to being towed to land it washed up on a reef and was apparently vandalized, with the outboard motor and some deck hardware having been removed. All evidence indicates that the tragedy was not related to a lack of skill or seamanship on the part of the Wingnuts crew, officials said. "This was a very experienced group of sailors," Rousmaniere said. "They sailed together a tremendous amount, knew the boat quite well and really responded to the conditions and the rising wind appropriately." Mark Morley and Bickell were particularly experienced sailors. Morley had sailed in 20 Chicago Mackinac races and Bickel had thousands of miles of bluewater sailing under her belt. The boat was co-owned by the Morley brothers and cousins John and Stan Dent. All of the crewmembers were wearing PFDs, as required by the racing rules from sunset to sunrise, and harnesses with tethers, he said. According to interviews conducted by the panel with members of the Wingnuts crew, the mainsail was down and the crew was in the process of furling the jib when the boat capsized. Arzbaecher said members of the Wingnuts crew told him after the rescue that the boat had been through storms and knockdowns before but had always come back up. The storm, which was forecast well in advance of the Saturday, July 16 start of the race, was not unusual for the time of year, said Chris Bedford, the chief meteorologist of the race. "We had an extreme heat wave in progress and the Midwest was primed with lots of heat and a lot of flooding, so there was a lot of moisture in the atmosphere," said Bedford, who has been forecasting weather for the race for 25 years, the last three as the official race meteorologist. "Anytime there are thunderstorms in that part of the country, we think about the potential of them being severe. This is a pretty normal occurrence for that part of the world. It only seems extreme because people were there and exposed." The storms that rolled through the upper Great Lakes during the race consisted of multiple cells that merged, he said. "There were two cells that merged close to where the accident happened," he said. This may explain reports from several boats of prolonged periods of strong winds, Bedford said. "If they were in the area where cells were merging, instead of getting one blast, you're actually getting multiple blasts from multiple cells that appear to be one prolonged event." The highest official wind speed measured in the area was 60 knots, he said. Bedford also noted that there were no reports of significant damage onshore that would be consistent with an unusually strong storm. As race officials and sailors around the world wait to hear the investigatory panel's findings, some sailors say they hope race organizers do not overreact to the tragedy. Ron White, an accomplished multihull sailor and chief measurer for the race, said he hopes well-intentioned officials don't go too far in attempting to mitigate risks inherent in the sport. "I am concerned that this kind of thing can go too far but I'm glad there is an independent panel investigating it," White said. "How much do we want folks regulating risk away? From a personal standpoint, that's a decision that individuals have to make, but I can't speak for the club. "With preparation you can manage a lot of the risk away, but I think when it comes to accidents and the risk that's present in the sport, there's no way you can manage away the possibility that someone might get killed." In fact, much of the safety equipment required by the race committee was integral in the rescue of the six Wingnuts crewmembers. "If anything comes of this, it's that even a little bit of light or a whistle is helpful," Rousmaniere said. "The crew on Sociable heard those whistles." Arzbaecher and the crew of Sociable, which did not re-enter the race, were honored at the awards ceremony on Mackinac Island and are expected to receive U.S. Sailing's Arthur B. Hanson rescue medal. "Everybody was thinking it was this big, complicated maneuver," Arzbaecher said. "But I trust that most of the boats in the Mac race would have done exactly what we did. We just found the needle in the haystack."